on the same day you call. You don’t come to us..
Moving to a new server? Want to upgrade your server? Our friendly staff is available to help you! Most of the time we do same day appointments. Technician will visit your office or home and give you the best repair option. Depending on your problem we have different repair options available for you. 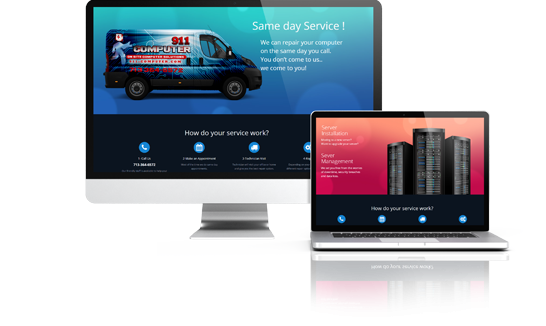 911 Computer provides computer repair (IT) services and solutions for small business and home user. Our team of experienced technicians can help your group optimize its current IT systems, and build a technology-based foundation to support your strategic business goals. We understand how important your computer is.. Because of that we offer same day service! We believe in flat rates, no games , no surprises. Technicians will give you up front prices. No repair, No Pay! Our helpful, friendly OEM and A+ Certified Technicians have repaired tens of thousands of computers. Our repairs are both thorough and affordable. We offer computer repair Texas, computer fix services, laptop screen repair in Houston Tx, Spring Tx, The Woodlands Tx, Magnolia Tx, Katy Tx, Conroe Tx. Please give us a call if your city is not listed for computer repair near me.